So sad a story it could make a tyrant break down and cry! You’ve heard about this story. It’s about our government’s unwavering insistence that the residents of Sogi - that relatively peaceful seaside community on the Mulinu’u Peninsula where they’ve been living for so many years - were told they would be evicted and then relocated to an inland community called Falelauniu. But a Sogi resident, an older man who asked not to be named, was bluntly defiant. “Whatever decision the government will come up with, we are not going anywhere,” he said. And then an elderly mother, Tala Leiataua, who said she has been living in Sogi all her life, made it quite clear she would rather not move anywhere. However, should the government insist on evicting her and her family, Tala said: “I will ask the government to dig a hole and throw us all in there. 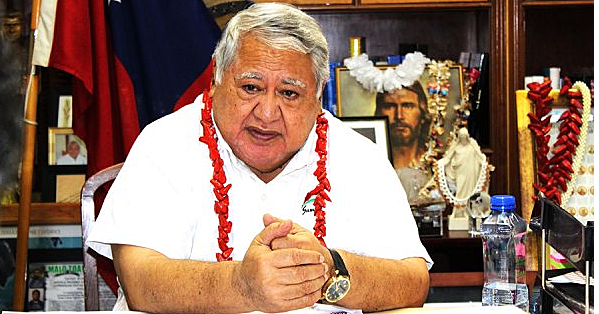 But the one family who is not going anywhere is that of Nanai Tokuma, a well-respected Samoan leader whose forebears were among Sogi’s original settlers. He said it was when his father was accused of the death of a businessman and now he was about to be hanged for murder. “I remembered vividly when our father said goodbye to us with his hands already handcuffed,” he explained. “He was about to be executed. His hands were already tied, there was a rope around his neck, and a piece cloth was covering his face. “And then as he was walking towards where he would be hung, two Chinese men ran up and told the Police that they were the ones who had killed the businessman. “My father’s life was spared. He walked out a free man while fighting back tears from his eyes, right in front of us children and our mother. And that was why we were offered this land where we’re living on now. “This land was given to our father, the late Tokuma Torurae, by the late Mata’afa Faumuina Mulinu’u II, the first Prime Minister of this country. It’s a poignant story all right. It is so sad you just can’t help thinking that just listening to it even a tyrant would break down and cry.